I'm not sure anyone was really asking for it, but Star Wars is nevertheless back again. Will it win the month? Does it have the slightest chance? I believe it can be number one, yes, if Jumanji underperforms, and maybe The Greatest Showman opens a little lower than expected. Don't give up hope, Star Wars fans! Editorial note: all below release dates are subject to change, pending the public airing of the tawdry history of any cast members or filmmakers involved. But not the last film. The franchise that has so mercilessly dominated our past two holiday seasons returns to take this year's top prize as well, and not you nor I nor anyone else can stop it from claiming its annual pound of financial flesh. (Yeah, sorry, I made that too disgusting-sounding; by the way, interestingly, there's no Star Wars movie slotted for December 2018, and, looking at that year's schedule, the winter line-up seems to be bereft of an obvious box office champion. Wreck-It-Ralph 2? The new animated Grinch? Et tu, Bumblebee? This should be good). Anyway, with The Last Jedi, technically Episode VIII but really their ninth film, the Star Wars series is entering the kind of rarefied umpteen-sequel air previously mostly enjoyed by 1980s horror films (as I always point out, unlike Star Wars, at least those movies had the decency to be short). And as much as I try to ignore it or pretend it ain't there, this is the one that will tower over this month and everything and everyone in it - whether you count the other films individually or add up all their numbers, they don't stand a chance. Star Wars will lord over the soon-to-be Oscar winners and sharp-written dramas and terrible horror films and low-brow comedies and musical period pieces and modern-day jukebox musicals and even over films where no less than Dwayne Johnson himself bravely strides through the jungle wilds, mud-wrestling crocodiles into submission. All will be shaken, beaten, and put down. In the grand scheme of the Star Wars universe, none of them matter. The late Carrie Fisher stars as Princess Leia once more, in a meaty role that should give her a fond farewell, and press tear ducts into fervent action across cinemadom. 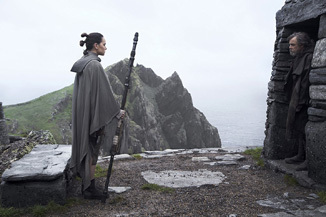 Daisy Ridley returns to play the series' signature trope, the spunky lead with some shaky genealogical ties, while Adam Driver is back as the pervert with a Darth Vader mask, John Boyega is again Daisy's apparently platonic confidant, and Oscar Isaac is the helpful resistance pilot who's still fighting the good fight, and always will be (by the way, did no one else care that, in The Force Awakens, his character disappeared, seemingly dead upon ejection from a plane, and then randomly re-entered the plot an hour later, like it was obvious that he had, A. survived, and B. found his way to safe haven? Does that happen alot?). Elsewhere in the galaxy, Domhnall Gleeson, usually the picture of warmth, reprises General Hux, a villain who'll probably meet his end sooner than later, all the more to make the Driver-Vader look tougher (Gleeson does seem scary as the exterminator in Peter Rabbit, by the way). Going back to the accounting part, everybody knows that Beauty and the Beast won the spring ($504 million; hey, not too shabby!) and Wonder Woman rather decidedly claimed the summer ($412 mil and counting); but as films as ridiculously overachieving as Jurassic World (2015, $652 million) and Finding Dory (2016, $486 million) have already learned, you can show up at any point during a year and make all the money you want, but that Star Wars movie is still coming out in December, and it's still going to beat you, no matter how much you've think you've earned or how safe you might assume your lead was. With the weird and possibly fictional exception of 2002, Star Wars has won the year every time it's put itself out there, and we're not living in another exception. As we know, the last official sequel, Star Wars: The Force Awakens, arrived on a quiet Thursday night in December 2015 and within a scant few weeks had become the biggest movie of all time ($936 million... really? ), rather easily beating Avatar's previous record high ($760 million... was that absolutely necessary?). Then, Rogue One came last year, and saw and conquered in due course, finishing with $532 mil and probably establishing that number as the absolute bare minimum for The Last Jedi's kitty. With one exception (...), everyone wants to see if Daisy really is Mark Hamill's daughter, see, and that alone apparently justifies Star Wars 2017 a box office in the near billions, if not more. Gross on. Our hero is Dwayne "The Rock" Johnson, who recently surrendered the title of "Sexiest Man Alive" to Blake Shelton (those "Miss me yet?" billboards are comin' up town by town, to be sure), but whose box office clout is as consistent as his presence in at least two or three films a year. Jumanji, for one, will in roughly a month's time become Mr. Johnson's thirteenth $100 million domestic release. Here, he follows in the grand Rock tradition of swooping in at the charity of his heart and curing an ill franchise of its troubles, this time giving the kindness to the Jumanji brand, tales of board game adventures turned into real life mischief. The book, by Chris Van Allsburg (of The Polar Express), was published in 1981, and the original film, with Robin Williams as the grown-up wildman who was trapped in the game as a New England child, opened in 1995, grossed $100 million (on the dot), and became a staple of the childhood entertainments of the millennial generation (I've seen Williams' Jumanji probably over ten times, mostly about 20 years ago). They even made a sequel! Zathura, by Jon Favreau, which was more board game fun, finished with a meek $29 million in the cool winter months of 2005. But that wasn't the last we heard of it. The new film looks much bigger in scale, as the board is replaced with a video game, and the film takes the premise away from the hallways of the suburban U.S. and into the jungles of the fantasy wild, where adventurers played by name actors like Johnson, Kevin Hart, and Jack Black do battle with beasts and creatures for the entertainment of teenage gamers who've newly stumbled onto Jumanji. There's an appetizing-looking crocodile nestled next to Hart on the poster, and rising thespians like Karen Gillan (of the Marvel Universe, pure evil) and Nick Jonas (the surname is familiar) join them on the quest. Johnson and Hart teamed together for the reasonable summer hit Central Intelligence, which grossed $127 million and inspired a... memorable... tagline (yes, I believe it was, "Have a little Hart and a big Johnson". Fair.). This particular re-teaming has received some good early buzz, perhaps the best in the franchise, and should most likely find itself the most popular counter-offer for action, adventure, and goodhearted cheer this Christmas. Especially if, as I do, you think that galaxy is just a little too far away. The Barden Bellas, a college group of a capella songstresses, make their return once more, as they re-band and again find themselves in a competition up against weirdos and perverts whom they must defeat in song battle, so moral order can be restored to the world (but as the film begins, expect lots of scenes of their post-college life disappointments). Everyone who's anyone is again in the cast, as Anna Kendrick leads, along with breakout star Rebel Wilson, who with previous singers like Hailee Steinfeld and Anna Camp must face off against the new evil queen of cover music, Ruby Rose, in her fourth of four agreeably memorable big-screen roles this year. She has style. While not for everyone, I think, the Pitch Perfect franchise is kind of Austin Powers-like in its box office life, having begun as a successful mid-level film ($65 million total) before transmorphutating [sic] into a mega-watt sequel that grossed one hundred and eighty four million dollars (comparisons end there). The first Pitch Perfect, surprisingly, played its first weekend in relatively limited release, on 335 screens, but now these films are up there with the big fish in town. Always the wanderer, moving from the September of the first film and the May release of the second, the Pitch Perfect series finds itself now in December, one of two musicals, technically, out in release, along with Hugh Jackman and his dancing elephants. The trailer promises us this is the last one, I think, and there's not much new or bigger-scale in this follow-up to distinguish it from the previous, but that should be fine - fans of the material know what they like, and they're getting it again (the mix of cover songs and toxic humor remains, certainly). Part 2 will likely reign over as this franchise's high point indefinitely, with part 3 finding itself smack dab between the totals of the other two. Its numbers will be helped by Christmas box office days, which are very long and not particularly productive for industries outside of theater or restaurant owners. Song and dance and fur man Hugh Jackman takes on another period musical role, and after the triumph of Les Misérables, here goes for a setting and premise a little less soul-crushing and baroque, if you'll have him. Showman Jackman stars as P. T. Barnum, the mayor of Bridgeport, Connecticut, and, on a slightly more relevant note, the creator of the pre-modern-day circus, as well coiner of the term "show business" (thank you), a fact he is not shy about bringing up in the trailer, as a punchline to all the musical interludes. Adults who seek age-appropriate entertainment with period settings, dancing elephants, musical numbers, and a bit of, yes, showbiz sparkle, might find it here more than any elsewhere this month. The cast is assembled from lively performers, some, like Zac Efron, with musical experience (going back to his high school days, I hear! ), with Michelle Williams as P. T.'s wife Charity, Rebecca Ferguson as Swedish soprano Jenny Lind, and Zendaya, recently and forever of Spider-Man fame, as a circus acrobat. Bearded ladies and Canadian giantesses are also included. The film arrives at a tough-to-read moment in the bloated cultural conversation, released at the very year where the Ringling Bros. and Barnum & Bailey Circus ceased operation after 146 years. This portrait of year one may inspire more than a little interest in that past, especially since what's here is Hollywood fantasy, papering over the rougher edges of the man's existence, and making sure no animals were hurt in its production, I assume. Director Michael Gracey makes his debut here; the songs are original creations of Pasek and Paul, the lyrical team behind the recent La La Land; and the story seems to play as a rags-to-riches, typical Horatio Alger, who was a contemporary of Barnum and presumably also wanted to run away and join the circus. Here is the bull, Ferdinand, who materializes to wreck a china shop (his birthright) before proceeding to journey faraways home to the little girl who loves him. The release date up there is not one of my many typos - the film is really opening against Star Wars, bravely and brazenly, as a bull must, and conceding that almost no headline written about the weekend's box office will include that name Ferdinand in the title. But that's okay. It's okay because Ferdinand will play well for a good few weeks anyway, while children are out of school, as the enthralling Coco winds down in its fifth week; and even though another children's film also comes to town (Jumanji, of course), it at the very minimum isn't animated, or at least not any more than it has to be (... The Rock has grown to such proportions that he should be forgiving if ever mistaken for a special effect). In any event, few big CGI animated films ever work hard enough at being bad to finish with a box office under $100 million, and Ferdinand displays no evidence that it'll be met with anything but favorable critical acclamation. The film comes to us courtesy of Blue Sky Studios and Fox, previously of Ice Age fame, and the cast, as expected, includes an impressive roster of comedians (this is Gabriel Iglesias' fourth major voice role of 2017, for heaven's sake, and Kate McKinnon and Bobby Cannavale couldn't be kept off the set, either). Our bull hero is voiced by WWE survivor John Cena, who, through no fault of his own, recently found himself a participant in what I think ought to be the worst scene of the year, if it isn't: the heart-warming climax of Daddy's Home 2, set in a movie theatre, where, one by one, every lead character's heart melts, their life-long emotional problems and personal issues dissolve, and they rejoice together in a particularly out-of-tune musical performance. While it's true that we must remember the past or we are doomed to repeat it, that phase of Cena's career must be given an exception. With Ferdinand, he'll be going uphill. There is no use at this point in recounting the events of the last two months, even specifically as relevant to this motion picture. It is safe to say, however, that Academy Award-winning actor Kevin Spacey, who had oddly put on old age makeup to play gazillionaire J. Paul Getty, then 80 years old (21 of which were Spacey's senior), is no longer officially affiliated with this motion picture; and, in fact, has now been replaced by a genuine senior citizen, Christopher Plummer, who's spent the recent decade starring in surprisingly merciless thrillers like Remember (2015) and winning the occasional Academy Award for his troubles (Best Supporting Actor, Beginners, 2011). Of course, the recasting and the age gap were unrelated. Charlie Plummer, no relation, plays the Getty grandson, John Paul Getty III, who was abducted by criminals in Italy at age sixteen, in 1973, with a ransom demanded for his return (hefty, if not quite all the money in the world). Michelle Williams is his mother, perhaps surprised that her father-in-law won't immediately bail out his grandson, while Mark Wahlberg is a family lawyer and confidant assisting in the transaction, such as it is. Would you hate me if I spoiled the film and told you that John III survived? Hate away. (Getty III is the father of actor Balthazar Getty, whose existence thus serves as a sort of spoiler of the ending anyway). Director Ridley Scott flew in the more experienced of the two Plummers to play the role less than three weeks ago, and already we have new advertising materials for the film, like a poster and trailer (no frightful face-altering special effects were deployed on the actor, who looks less like Getty and more like his jolly self). With the relevant reshoots now essentially complete, everything should proceed as planned, and the film will, I'm sure, generate enough interest to be a healthy option for adult filmgoers looking to take in one of those so-advertised Oscar-branded films at years' end. As for Kevin Spacey? I believe Tom Hanks was recently flown in to re-shoot his role in American Beauty, with VHS copy recalls set to begin shortly. Alexander Payne directs Matt Damon into a world not many years removed from now, where some human beings use an irreversible procedure to shrink themselves down to five inches tall, wherein their meager salary instantly turns, on that scale, into a fortune, and they can afford to buy a tiny bit of everything, right good for their size. So Damon shrinks, his wife holds back at the last moment, and the film proceeds as you might expect, as the man re-evaluates his life and acquires a new love interest (Hong Chau), while interacting with any number of scene-stealing character actors (squint in the trailer and see a pint-sized Margo Martindale, Jason Sudeikis, and Christoph Waltz, living in miniature bliss). Kristen Wiig, as the de facto giant-sized spouse, should offer a splash of dry humor even as Damon shrinks down and out of sight. The concept is pretty brilliant and perfectly logical, when you think about it. And while Damon headlined George Clooney's dark and unwieldly satire Suburbicon not long ago, this one should appeal wider: Reviews are quite good, though occasionally divisive, and Payne has enough goodwill, at least outside of the oppressive Nebraska (his 2004 outing Sideways is pretty much my favorite movie ever; it doesn't get enough respect). Suburbicon may not take off quite right away, but with some word-of-mouth and occasional awards attention (I assume some will forthcome) it should pull itself up by its bootstraps to high status among the month's less flashy entertainments. Another title we're meant to take more or less both literally and as a humorous pun, as Ed Helms and Owen Wilson discover they are the products of a non-paternity event (that's the medical term), and embark on a slapstick quest to uncover their biological father (as I understand it, the same man is responsible for the conception of both of them; thanks, dude). In the U.K., the film is known as Who's Your Daddy?, a title I think must have already been used for any number of American films, television series, and miscellenea. Cinematographer Lawrence Sher makes his directorial debut, Glenn Close plays the secretive mother, and the roster of potential daddys is filled by Christopher Walken, Terry Bradshaw (...playing himself), J. K. Simmons, Ving Rhames, and so on (was Sam Elliott unavailable as the inevitable right answer?). The trailer promises broad, unambitious comedy, and in a month without a clear frontrunner or ballbuster in the comedic genre, there's probably enough room for a film of the lowbrower sort, away from the more refined, high-cheekboned Downsizing or the insider-baseball references of The Disaster Artist. And at this time of year, a film about bringing the whole family together makes a certain amount of sense. I did say, "a certain amount". This is a film title that lovingly mocks its star character, much like The Disaster Artist itself, which is about the making of The Room, a micro-budget 2003 romance drama notable for having been repeatedly touted as the worst movie ever made; though, 1) Have they seen any Star Wars film of their choice?, and 2) I assume thousands of other such no-budget (and a few quite high-budget) enterprises that languish in obscurity could reasonably stake a claim for that status. I'd never heard of The Room, but it has amassed a rich and abundant cult following. No connection to the great 2015 drama Room will be inferred, I hope. James Franco undergoes facial alterations and acquires shoulder-length hair to play Room filmmaker and star Tommy Wiseau (I suppose if you didn't know, you might not recognize instantly), while Dave Franco is actor Greg Sestero, who trusts along with Tommy, and a who's who of actors and filmmakers, largely of the Apatow troupe of traveling performers, appear in supporting roles (Alison Brie as the girl with the heart of gold, along with Zac Efron, Ari Graynor, Bryan Cranston [Franco's co-star in Why Him? ], and so on in what is sure to be a lengthy if rewarding credit scroll). Films about filmmaking don't make a lot of money, I guess (even I'm not really a behind-the-scenes guy, honestly), but a lot of people who know movies get the joke, and The Disaster Artist has had a lot of healthy buzz for almost a year now, from its premiere at SXSW in March to Toronto festival screenings in September, with Franco, James, getting some plausible awards buzz at the moment (the film expands three days before the Golden Globe nominations, where his name is certain to appear). For an odd title about an underground classic, the film should pride itself on coming in #9, if that is indeed its fate. By all appearances this is one of those laid-back comedies with all-star baby boomer casts (or baby boomer+, often), like Last Vegas, the new Going in Style, or Stand Up Guys. The films almost always star legendary actors of a certain age, who attempt to reach a life-long goal, lapse into brazen criminal activity (a robbery, most often), or simply pal around at each other's expense, recalling merry old times and heartbreaks while facing a less charitable future. Sometimes, whether or not the subject is theft or simple celebration, the setting is in Las Vegas. One of the leads in this subgenre is invariably played by Morgan Freeman, and indeed, Freeman is one of the headliners in this film as well, playing opposite Tommy Lee Jones, Rene Russo, and the last role of Glenne Headly, who died in June. Often, these films are highly profitable. Others live more on the margins. Here, the action begins in a Palm Springs, California, retirement resort; the battle is, still, against the mob, though romantic entanglements also flitter through the plot. The film gets itself a nice, snug release date in the bare early days of the month, when most people are still in hibernation, and when its biggest new competition for box office glory is James Franco's implacable accent in The Disaster Artist. Who knows, if the big hitters of November even drop quite enough, Just Getting Started may well win its weekend, though not with the numbers I'm giving it. Not a film, but a description, as the last titles to qualify for Oscar contention raise their heads, one by one, theater by theater, in preparation for wider releases in late December or all the way to January. Most people are still waiting for Darkest Hour and Call Me By Your Name to slide themselves into a theatre nearby, and the waiting list will get larger still with the platform releases of Guillermo del Toro's dark fantasy romance The Shape of Water, Woody Allen's latest period piece Wonder Wheel, with Kate Winslet and Justin Timberlake at Coney Island, and I, Tonya, where Margot Robbie channels a beleaguered skating legend, from her working-class upbringing to a notorious 1994 incident that she may or may not have instigated. Late in the month will see the unrolling of Hostiles, a Western with Christian Bale and Wes Studi, and The Post, Steven Spielberg's early 1970s dramatization of the Washington newspaper's many adventures, some wacky, some less so, with Tom Hanks and Meryl Streep in the leads. That's one a relative few will see until January. Start looking at your watch.